There is a sad truth that we are living in a “throw-away society.” We mass produce disposable products made from plastics because they are convenient and does not cost much. We change our smartphones, accessories, electronic items constantly and often have the mentality of not using the old, outdated trends. Many of us do not even want to wear a same set of clothes twice because they are “so yesterday”. However, if you know how much the trash we’re producing is affecting our environment and our health, you will probably rethink every time you throw or change any of your stuff. Our natural resources are limited, and the waste does nothing but destroying the water, the soil and the living organism. Now, we can contribute to protecting the environment and limiting the waste by replacing or reusing the daily consumable items instead of just using them once. There are many ways to reuse the product in your life, so if you are new to this “Sustainable Living” journey, we will give you some suggestions. There is a proverb saying “The leopard cannot change its spots” and using disposable items is the so-called “spots” of many people. Therefore, switching to a reusable analogue product can be tough and unfamiliar at first. In fact, the majority of beverages sold in various stores and supermarkets are contained in plastic bottles. These are certainly cheap and convenient but can place a heavy impact on the environment. You can replace it with tumblers or glass water bottles that are already on sale. These options help to reduce plastic waste and save a lot of money. In Vietnam, every day people consume tons of plastic bags. 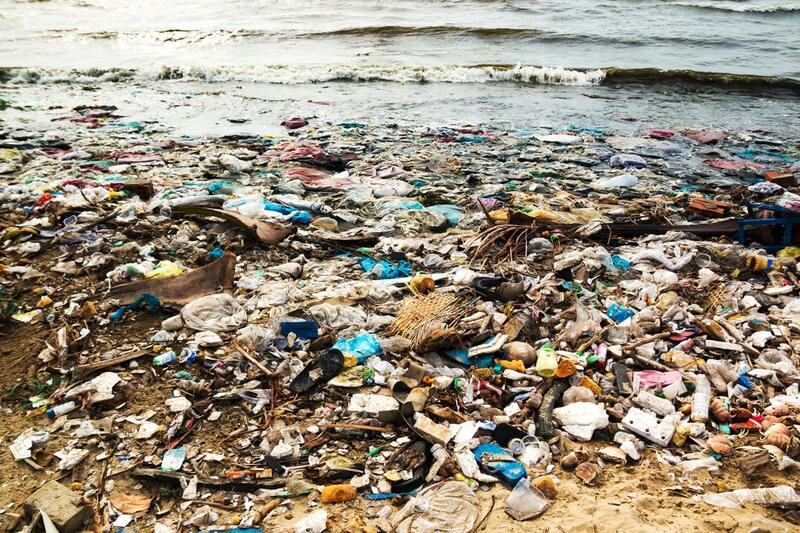 You can help reduce this kind of plastic waste by carrying a reusable eco-friendly bags. There are many types of reusable bags to choose from, including bags made from cloth, paper, straw, etc. They are safe and easy to clean and can be reused many times. Disposable straws, spoons, chopsticks, dishes, bowls, containers, mostly made of plastic, also consumed no less than plastic bags, and of course, they also cause serious pollution. You can use a washable kit made of metal, wood, porcelain, alloy, … for every meal, whether you’re at home or at a restaurant. For the beverage chain, the number of beakers, straws and bags used daily is enormous. Understanding the concern about environmental pollution and the dangers of plastic, PJ’s Coffee Vietnam has developed a long-term plan to reduce plastic consumption in its business. In each stage, PJ’s Coffee is committed to remove one plastic item and replace it with environmentally friendly options such as paper, bamboo or reusable materials such as metal. 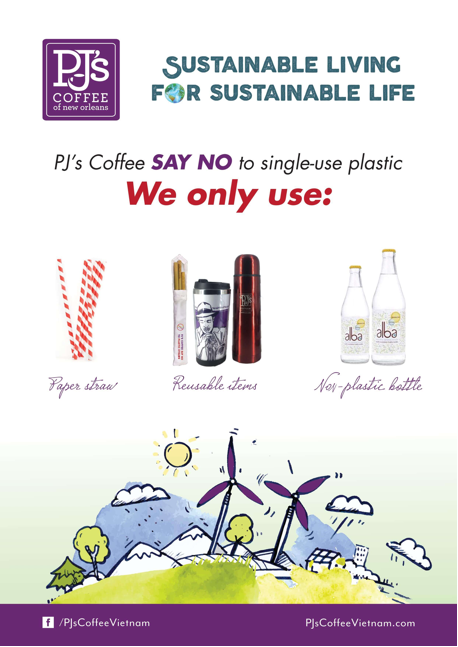 Starting in April 2018, PJ’s Coffee Vietnam launched the first project “SAY NO TO PLASTIC STRAWS”. The first event was on April 14th, PJ’s Coffee successfully partnered with CHANGE Vietnam in the iChange Plastics campaign for the Forbes 30 Under 30 event. Following the success, PJ’s Coffee’s red plastic straws were all replaced with environmentally friendly straws. 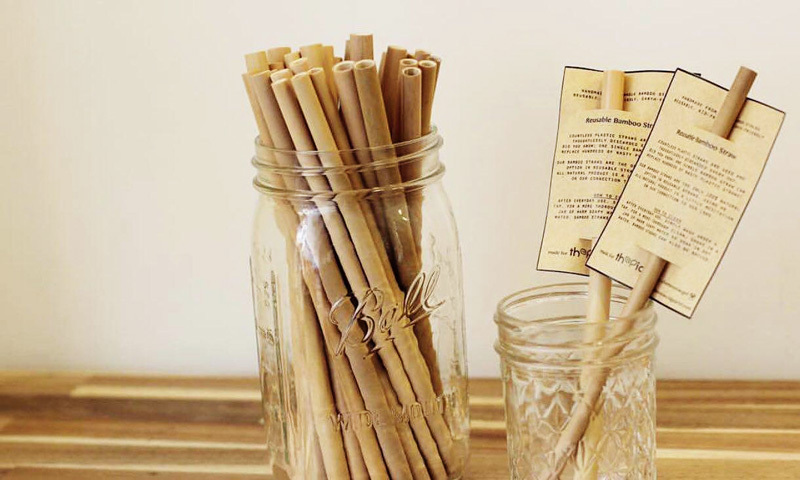 In addition, PJ’s Coffee will provide reusable bamboo straw sets for sale at all stores on the 14th of June.